2. Put one of these banners in your signature. They are the right size for the Den of Angels form, the ED forum, and most other forums. You could also post on other doll forums if it is allowed in their rules. Thank you all so much! Another thing you can do is invite your favorite doll artists, especially if you own one of their dolls! 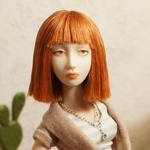 And if you are a doll artist, you can help buy mentioning the new forum in your newsletter or on your blog. The more people here, the better for everyone!